Hastelloy® flat head screws are in stock and available now - such as Hastelloy C276, which is generally considered a versatile and highly corrosion resistant alloy. Hastelloy screws have excellent corrosion resistance in both oxidizing and reducing media which makes it well suited for a variety of strong corrosive applications. Hastelloy flat head screws also have exceptional resistance to both sulfuric acid and hydrochloric acid. Because Hastelloy screws resist some of the most severe media, Hastelloy flat head screws are often utilized in chemical processing applications where acid chlorides, solvents, formic and acetic acids, acetic anhydride, wet chlorine gas, hypochlorites, chlorine solutions and phosphoric acid are used. For chemical processing applications, Hastelloy C276 is the most common grade and one of the most corrosion resistant nickel alloys - exceeding that of most other nickel alloy grades like Inconel or Monel. 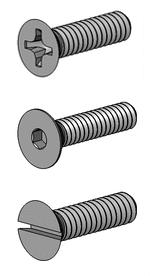 Hastelloy flat head screws are characterized by having a head with a top flat surface (which can feature either a slotted, phillips or allen driver) and bottom that is cone shaped or countersunk. With this design, the head of the screw can align flush or below the surrounding surface having obvious benefits. Slotted heads are typically better in applications where it's going to be unscrewed and re-done periodically, as the head tends to wear less. Phillips head offers a much stronger joint since it can tolerate more torque. For most flat head screw designs the angle of countersink is usually 82° for UNC and UNF applications however other angles ranging from 60° -120° could be specified. Confused about which grade of Hastelloy bolts are best for your corrosive application? Read this short blog post which gives an overview of each grade's strength. If you need more indepth direction, visit our Hastelloy grade pages or contact our engineering team. Hastelloy C276 alloy, UNS N10276, is the most widely used and versatile, corrosion resistant alloy. Very good resistance to reducing, and mildly oxidizing corrosives. Excellent stress corrosion cracking resistance with very good resistance to localized attack. Select the following links for more details about Hastelloy C276 Fasteners, Hastelloy C276 Bolts, Hastelloy C276 Screws, and Hastelloy C276 Flanges. Hastelloy B3 alloy, UNS N10665, resistance to hydrochloric acid and other strongly reducing chemicals but has poor corrosion resistance to oxidizing chemicals and in the presence of ferric or cupric salts. In addition, Hastelloy B2 has excellent resistance to pitting and stress corrosion cracking. However B2 has little chromium, and it should NOT be used with oxidizing media in the presence of salts. Select the following links for more details about Hastelloy B2 Bolts, Screws, and Flanges. Hastelloy B3 alloy, UNS N10675, is specifically designed to deal with very aggressive hydrochloric acid (HCl), hyrdrobromic acid (HBr) and sulfuric acids (H2SO4) as well as acetic, formic and phosphoric acids. Additionally Hastelloy B3 has improved structural integrity over B2. However B3 has little chromium, and it should NOT be used with oxidizing media in the presence of salts. Select the following links for more details about Hastelloy B3 Bolts, Screws, and Flanges. Hastelloy C22 alloy, UNS N06022, has better overall corrosion resistance in oxidizing corrosives than C-276 and Inconel 625 alloys due to the higher chromium content. Outstanding resistance to localized corrosion and excellent resistance to stress corrosion cracking. This alloy has limited availability and can be made into fastener in larger diameters only (1/2" and greater in size). Select the following links for more details about Hastelloy C22 Bolts, Screws, and Flanges. Hastelloy C2000 alloy, UNS N06200, is a corrosion resistant alloy with excellent resistance to uniform corrosion in oxidizing or re-ducing environments. Due to the addition of copper and the high content of chromium, it has enhanced corrosion resistance to sulfuric acid and process streams contaminated with ferric ions. In addition it has excellent resistance to stress corrosion cracking and superior resistance to localized corrosion as compared to C-276 alloy. This alloy has limited availability and can be made into sizes only 1/2" and greater is size for fasteners and flanges. Select the following links for more details about Hastelloy C2000 Bolts, Screws, and Flanges.